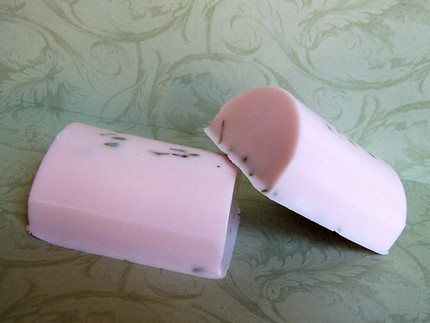 Lavender soap is very popular among the soapmakers. It is not only because of its lovely and soothing scent. But Lavender itself is said to relieve depression and stress. Also, Lavender is an herbal ingredient with proven benefits to the skin, including its ability to repel mosquitoes. Making your own soap at home is the best way to know that the soap you use contains only the best and freshest ingredients. One of the biggest causes of dry skin that breaks out is using too harsh of soaps. But, handmade soaps are made from natural ingredients that are gentle on your skin, even if you have a very sensitive skin. Homemade soap can be a wonderful gift to your family and friends. Some people may find that handmade soap is considered a luxurious item. Treat the people you loved with these natural and safe skin soap. They will know how much you care for them. Making homemade soap is not difficult. We will do it together. Dont worry if you are a beginner. Once, you have mastered it then you may find it hard to stop! Lets start make our lavender soap! Lavender soap balls can be made from lavender water and unscented, good quality soft white soap. Grate a large bar into thin strips. Heat 60 ml of lavender water and pour over the soap. Leave it for 10 minutes, stir , then place in a blender, adding 3 drops of lavender essential oils. Cool and pour into a pudding basin. Leave 2-3 days or until the soap begins to dry out, then form into balls and place on a sunny windowsill to dry. When almost dry, dip your hands in lavender water then rub the ball to make it smooth. Put the base soap into a crock pot and add ½ cup of milk. Set it in a lowest temperature. After one hour , the mixture will looked like soft mashed potato. Then you can add vitamin E or jojoba oil. Add color and add several drops of fragrance oil. Sprinkle the dried herbs into the mixture. Stir all the ingridients, then pour into the molds. For quicker cooling, place molds in the freezer for a few minutes then remove and continue cooling at room temperature. Melt the soap over low heat until it liquefies. Add the grated beeswax and stir until it melts. Remove from heat and add the perfume oil and the coloring. Stir until it is well blended. Pour the mixture into a mold and let set for three hours or until it is hardened. Handmade soaps make great gifts and work very well in ritual baths. For gifts, you can consider putting a special item in the soap such as a charm or a crystal. Aromatherapy Soap - This page contains easy instructions on how to make your own aromatherapy soap using melt and pour soap base.